Jazz guitarist nonpareil Steven Kirby’s radiant new vision is the perfectly titled Illuminations. The recording – textured, ebullient and lyrical – represents a lengthy stride in the creative evolution of a significant talent. Kirby, whose experience include work with Chris Potter, Mike Manieri and George Garzone, as well as de rigeur experience in the classroom at Berklee, brings his deep roots to the surface of Illuminations, and he proves in doing so that he has something new, organic and exciting to say. Helping Kirby with the heavy lifting is a first-call roster of Boston and NYC-based jazz musicians who all make creative contributions. Personnel includes: Aubrey Johnson, John Funkhouser (piano/keys), Greg Loughman (bass), Mike Connors (drums/percussion), and with guest appearances by Bill Vint (sax/flute), Mark Shilansky (piano), Steve Hunt (keys), and Ed Lucie (bass). Together, the gathering conceives an original musical universe, multi-layered and evocative, with colorful instrumentation and inventive musicianship. 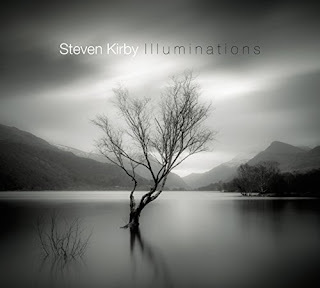 At the center of Kirby’s Illuminations is Aubrey Johnson, a vocalist whose wordless singing amid complex and creative compositions really stands out. Perhaps the best example is the title track, an exhilarating Brazilian tinged tour de force of jazz composition featuring stunning solos from guitar, piano, flute and Johnson’s lovely singing. Elsewhere Kirby’s “cinematic” and strikingly original arrangement of the classic “Over The Rainbow” succeeds in wringing real freshness from a worn out chestnut. Additionally, there are instrumental pieces ranging from lyrical, ECM-inspired jazz to fusion-fired adventures. The warm tone of Kirby’s nylon-stringed guitar flows through Illumination, and is dominant on the gentle “Returning” which evokes the best of Metheny/Mays. The album closer “Last Song,” is dedicated to Kirby’s daughter, Poomina, and is delicately wrought, with its ambience striking a distinctive balance between Metheny’s sonic tone and something closer to Bill Frisell. Sweet, but also with complexity and bite.